In 2010 I worked with the YES! Association on the project EQUALITY AGREEMENT 2010 (5 YEARS LATER) (JÄMLIKHETSAVTAL 2010 (5 år senare)). EUQALITY AGREEMENT 2010 (5 YEARS LATER) was a collaboration between the YES! Association and the exhibition space Röda Sten in Gothenburg with the goal to develop an agreement with the objective to increase cultural, ethic and social diversity in the art world, while simultaneously pointing out that we all have a gender, an ethnicity, a class belonging and a sexual orientation, and that these positionalities influence both the course of the institution as well as the individual’s agency and ability to act. How can we “name” without risking to reproduce the confining categories that we want to leave behind? In which contexts can the act of “naming” instead work emancipatory and lead to increased agency? How can the right to self-definition work in the agreement and how can it be implemented constructively in the daily work at Röda Sten? During the project, the YES! 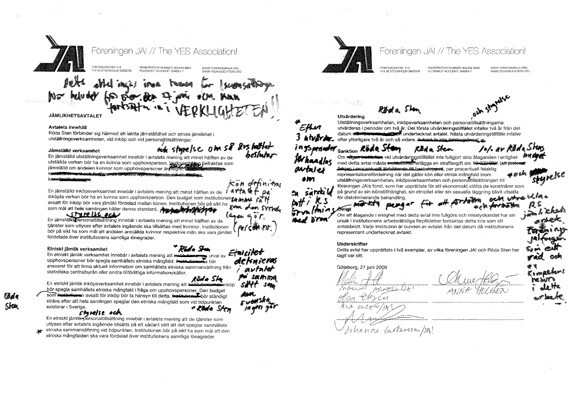 Association worked out an Equal Opportunities Monitoring Form and related agreements in a step to allow the Röda Sten to be able and willing to sign the YES! Association’s Equal Opportunities Agreement.